Martha's Vineyard is an island off the United States east coast, to the south of Cape Cod, both forming a part of the Outer Lands region. It is often called just "the Vineyard". 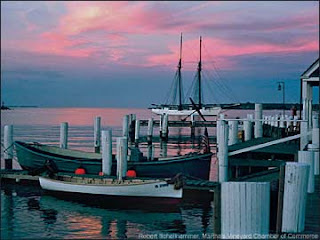 With a land area of 87.48 square miles (231.75 km²), Martha's Vineyard is the 57th largest island in the United States. It is located in the U.S. state of Massachusetts. The island is primarily known as a summer colony, and is accessible only by boat and by air. Nevertheless, its year-round population has grown considerably since the 1960s. 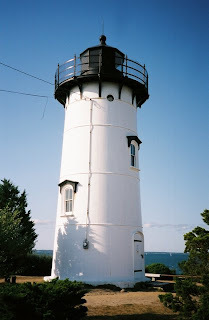 The East Chop Lighthouse is known as the Telegraph Hill Light and it sits on the highest point of Martha's Vineyard... "Designated "East Chop" on maps as early as 1646, the word "chop" was used by the English to signify the entrance to a channel." 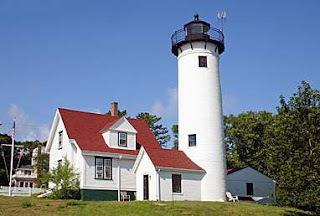 West Chop Lighthouse... Angela tells me... "I love riding my bike around Martha's Vineyard and taking in the beautiful homes." ENJOY your weekend and Happy PINK Saturday... don't forget to visit Beverly of How Sweet the Sound and all her PINK post friends! Such lovely pinks in the skies and such beautiful lighthouses. Happy Pink Saturday..
WOW Fifi!! This is amazing!! You make me want to be back there right now!! Thank you so much for this post about one of my most favorite places on earth! Happy Pink Saturday. 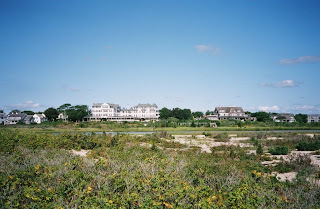 Thanks for the lovely photos of Martha's Vineyard. I would love to go sometime! Your painting of the pink bike with the flowers is beautiful! 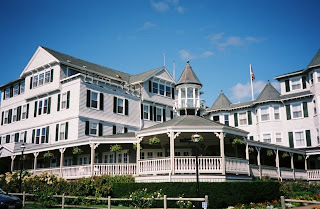 I've been to Martha's Vineyard a couple of times.....I wish I could live there...it seems like a storybook place to own a home. Thanks for the trip. Lovely Lovely photos and those colors of sunsets.. wow. One of my fave places on this earth....we have stayed there a few times. 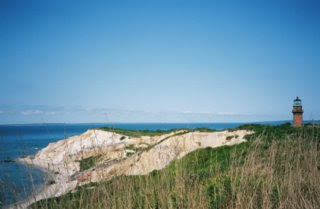 Oaks Bluff, Edgartown, Gay Head (not called that anymore ~ called Aquinnah now). Everyone used to wear shirts with Black Dogs on them now they wear Fish called Menemsha Blues. Fun fact....Michael J. Fox named one of his twins Aquinnah. 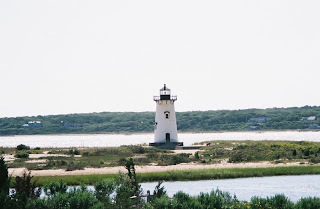 Also right behind the Edgartown lighthouse is an island called Chappaquiddick it's a 2 min ferry ride, it'sjust lovely so desolate with beautiful beaches. ps if you love MV you'd just adore Nantucket too !!! Wow, these pics are gorgeous. I feel like I just went on a mini vacation. Thanks so much for sharing! Love the post Fifi! Thank you. Happy Pink Sat to you. The closest I've been to Massachusetts is Maine. Kenneybunkport was about 16 miles from where we were staying. It was in early June and the weather beautiful as I lounged on a pier right off a jetty. Beautiful! Absolutely gorgeous! P.S. Love the bike painting. 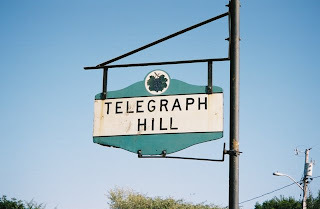 I loved the virtual trip - because I want to go to Martha's Vineyard someday, too. May we all go together? I've been there and it's a magical place. Happy Pink Saturday. Gee these look familiar!Come on down! PS Pick up your blog award! 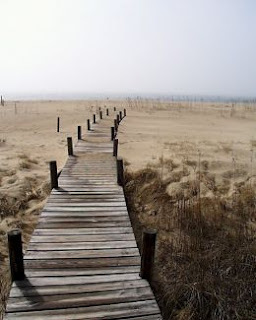 I would love to go Marthas Vineyard someday. It looks just beautiful. Cute pink bike! OOOOooooo, I wish I could go there. Very lovely. I hope you get to go one day soon! Happy Pink Saturday! Love all the "natural" pink you found on your trip - lovely to view! What a beautiful place! Wish I was there! Thanks for the virtual getaway Fifi!! Holy cow are those "darlings" cute! Love the pink bike..I did one too,last year on a board I found on the beach,photo is on Cindy's Romantic Home blog! Thank You for inspiring me to appreciate where I live although it is gray and gloomy now.Ugh! Love the Great Gatsby feel of these photos! I love this post! I live in Massachusetts and have been to the Vineyard a few times. Unfortunately I didn't make it there this past summer though. gingerbread houses. They are so bright and colorful. Walking around makes you feel like you are in a fairy land. I found someone's flickr shots so you can see. Thank you for stopping by my blog, and your very nice comment about my paper cuts! : ) It is appreciated! 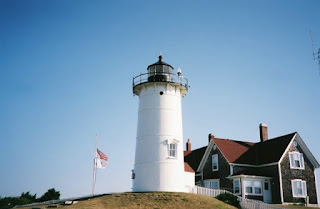 I have always wanted to visit Martha's Vineyard, thank you for sharing this tour! Fun post, Fifi. I've always wanted to visit Martha's Vineyard. I ordered Molly's bowl from the Black Dog Tavern. I thought it only fitting she should have a bowl with "her" picture on it! 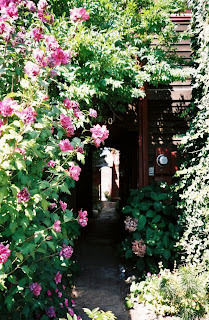 I was lucky enough to spend a long weekend in Martha's Vineyard in my pre digital camera days. 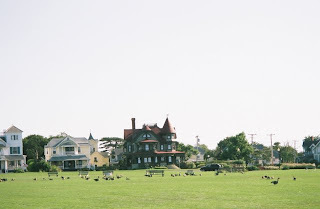 We stayed in the town of Oak Bluffs where the beauiful gingerbread cottages are located in the camp area. You would love painting them! I'll have to scan a photo of a pink one for a future Pink Saturday. Great vitual day tripping. Beautiful. What a beautiful spot! Wonder if I'll ever get a chance to visit? What a fun post, Fifi! Where did you have the lobster in Hyannis Port? 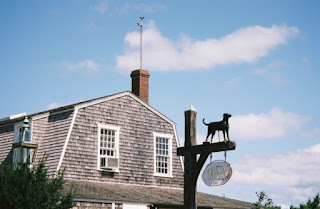 We ate at a great lobster place there on our way to Nantucket. Absolutely delish, but of course the name is escaping me!